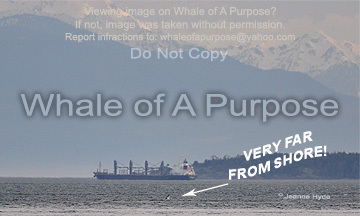 ...Shachi J-19, in a bit closer with a lunge - that helped! ...when last seen last evening, the whales were going up island, but this morning the K13s showed up coming up island!...so we know what they did sometime in the night...this is Deadhead K-27 - we didn't know it, but she was pregnant and soon to have a baby! 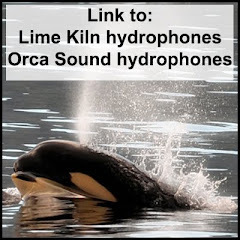 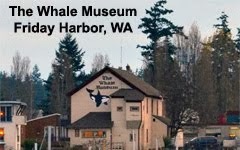 ...as we were coming back in to the harbor, we learned that echolocation clicks were being heard from the Lime Kiln hydrophones - ah, Group A was around somewhere! 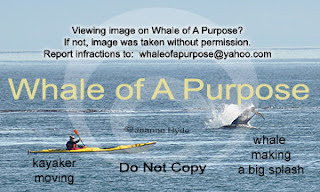 ...I couldn't make it to the park, but located the whales farther north...a kayaker was paddling out from shore and setting himself up to watch the whales go by...what happened next was the funniest thing! 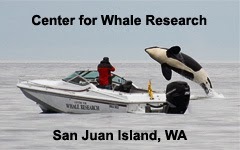 more fun than the humans! 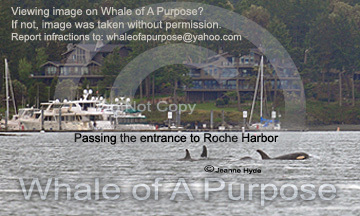 ...they were still pretty far down in that 'big water' when we left to head for the dock. 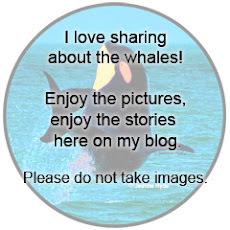 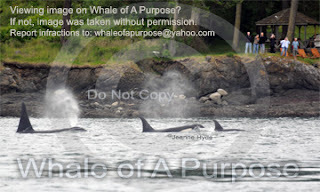 ...phone rings at about 9:15 - "got whales in Spieden Channel! 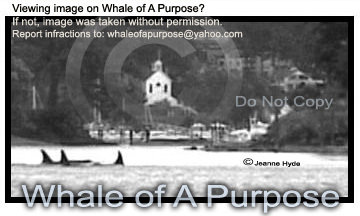 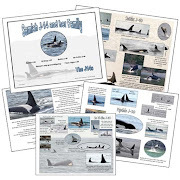 "...it was J pod...they rounded the corner and came down island past Lime Kiln and rounded the corner again going into Cattle Pass and continued on up San Juan Channel! 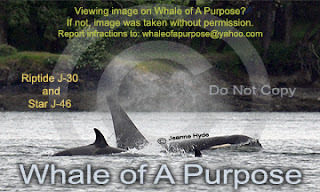 ...we didn't hear from J pod again for 17 days. 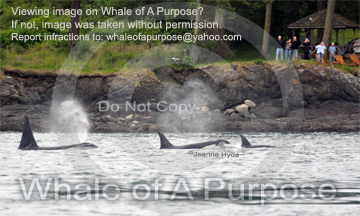 3-6-11 Onyx Has Take Up Residency with J Pod! 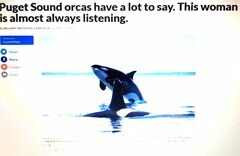 ...I'm at the computer, hydrophones on (of course) it's late morning..."I just heard something. 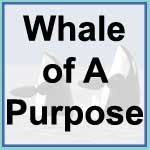 There it is again. 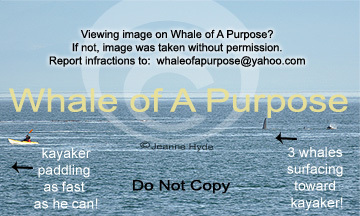 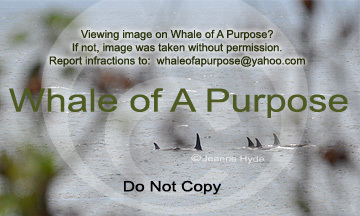 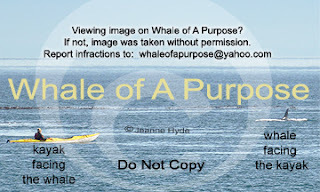 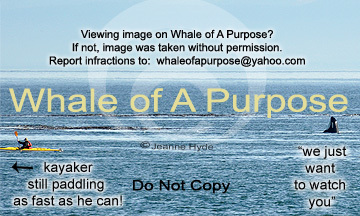 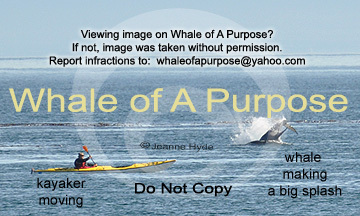 "...off and running - I knew there were whales out there, but where? 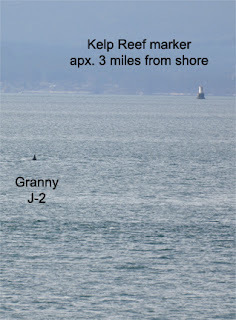 Granny was in the lead!...Spieden and Onyx, though not side-by-side, were traveling parallel not far behind Granny! 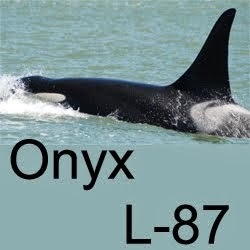 ...very cool - Onyx L-87 has taken up residency with J pod! 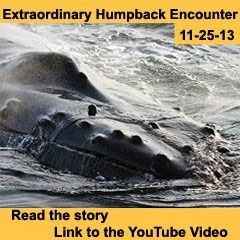 ...I wonder if she had another one in front of her! Yesterday is the first time all of J pod (that's Group A and B) except Ruffles have been seen together since December 2nd...that's almost 3 months. 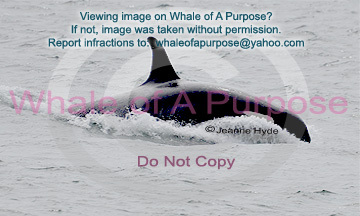 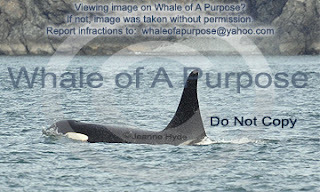 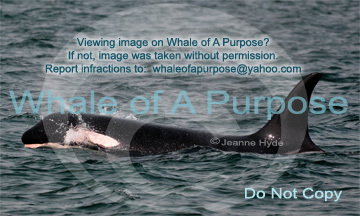 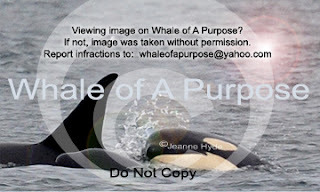 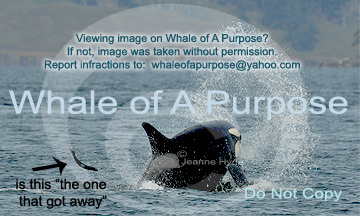 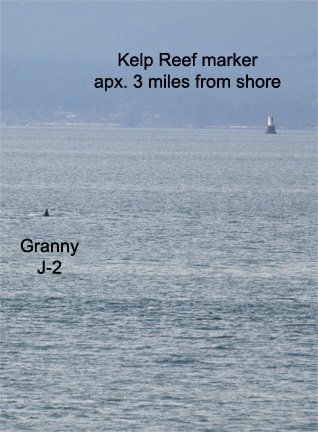 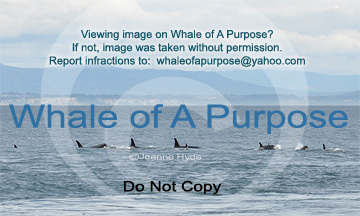 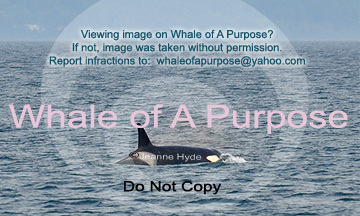 J pod Group A (Granny/Ruffles group) was seen with K Pod on January 3rd and January 7th. Ruffles was not seen either of those times. 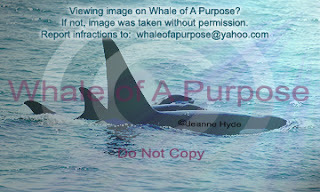 I believe the last sightings of him were in November in Puget Sound and then in late November off Victoria. J pod Group B and the K Klik were seen January 22nd and January 26th. 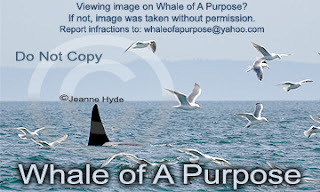 In the in between times there were audio encounters with J and K pod vocalizations at various times during the night on various days, but since no visuals there could be no identification as to which J and K whales were passing by. 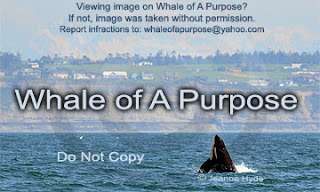 February 2nd, J pod Group B and all of K pod showed up in Puget Sound and stayed there for 8 days. 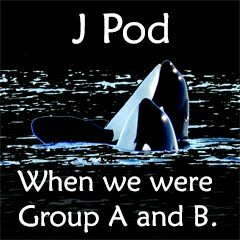 J pod Group B only was seen on Feb 13th. 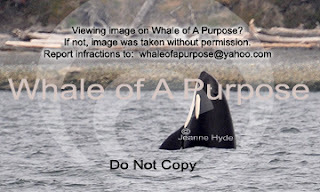 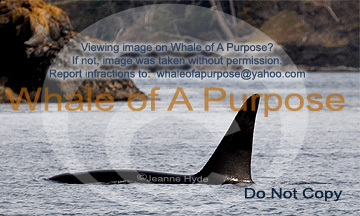 J pod Groups A and B were seen yesterday in Puget Sound (February 20th). 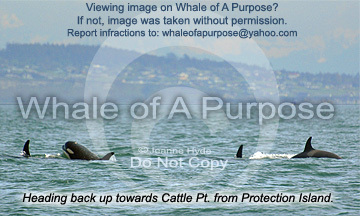 Added later: Ruffles was not ever seen again. 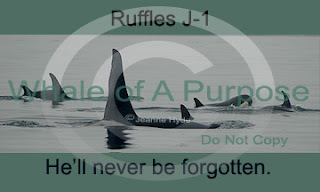 Ruffles will live on in the hearts and minds of many. 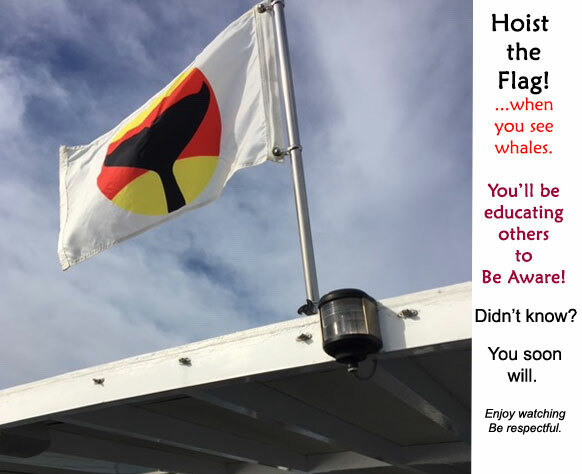 He will always be the Icon of the Southern Resident Community.